Stems clustered, forming dense clumps of short stems to 0.5 m tall, sometimes to 1.5 m tall, 2 cm diam., green, covered with reddish-brown scales. Sheaths open, not forming crownshafts, 27–28 cm long, green with reddish-brown scales; ocreas present; petioles 87–116 cm long, green; rachis 90–95 cm long; pinnae 9–13 per side of rachis, linear, contracted at the bases, middle pinna 42 cm long, 2.5–3 cm wide at the middle, apical pinna 16.5 cm long, 5 cm wide at the middle, lobed; veins scarcely prominent adaxially. Inflorescences interfoliar, pushing through the persistent, disintegrating, subtending leaf sheaths, spreading; peduncles 0.5 cm long, 0.9 cm wide; prophylls 9–14 cm long, persistent and erect, splitting abaxially; rachis absent; rachillae 3–4, 9–13 cm long, rectangular in cross-section, glabrous; triads spirally arranged; staminate flowers 6 mm long; sepals forming a 3-lobed, flat, membranous calyx 1.5 mm long; petals 3, 6 mm long, triangular, fleshy, acute; stamens 20–22; pistillate flowers 2.5 mm long; calyx 2.5 mm long with 3, free, imbricate, scarcely ciliate, non-acuminate sepals; corolla similar to the calyx; ovary 2.5 mm long. Fruits 1.8–2 cm long, 0.5–0.6 cm diam., ellipsoid, red-pink; endosperm ruminate. 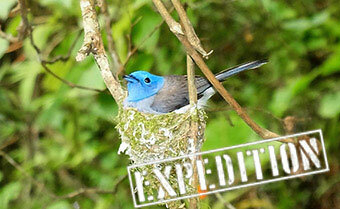 A new species described in 2008 for south Vietnam. 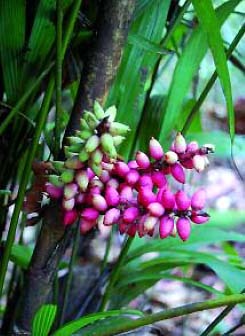 Pinanga cattienensis differs from all previously described species of Pinanga from Vietnam by its leaf sheaths which do not form distinct crownshafts and inflorescences which are not infrafoliar. Instead the inflorescences push through the persistent, disintegrating, subtending leaf sheaths. In this it is similar to P. humilis. Pinanga cattienensis differs from P. humilis in its spirally (versus distichously) arranged triads, 90–95 cm long (versus 38–39 cm long) rachis and 9–13 (versus 5–7) pinnae per side of the rachis.